Is there a tool available that can help me building queries for the XML/Rest sensor? Using the XML/Rest sensor it can be time consuming finding all the right settings for a specific situation. Is there a tool available that can assist me in finding the settings that I need? 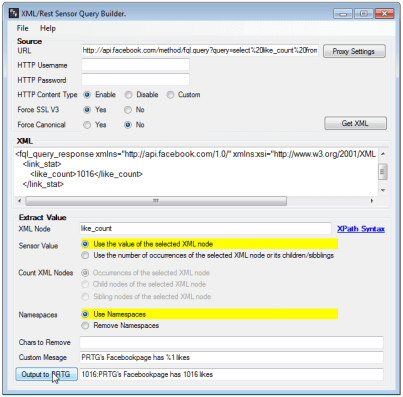 XMLRestQB helps you building queries for the HTTP XML/Rest Value sensor. Using the XML/Rest sensor it can be time consuming finding all the right settings for your specific need. This tool will help you to find your optimal settings in 4 easy steps. Once you have found your optimal settings, enter them the same way on the settings page of the XML/Rest sensor. PTF.XMLRestQB can be downloaded here. Does this tool support HTTPS? As I can get it to work via HTTP but any time I use HTTPS it comes up with the error "The underlying connect was close: An unexpected error occurred on a send". Yes, it does. This error message usually indicates incorrect credentials. If the url is public accessible, please send an email to support@prtgtoolsfamily.com and we will assist you further.